Slow-roasted, local, organic, fresh-from-the-garden tomatoes are summer in its physical, vegetable form, concentrated and packed into tasty sweetness. Honestly. I bought pounds, and I mean pounds, of organic cherry tomatoes from Vicki last year and slow-roasted them all. 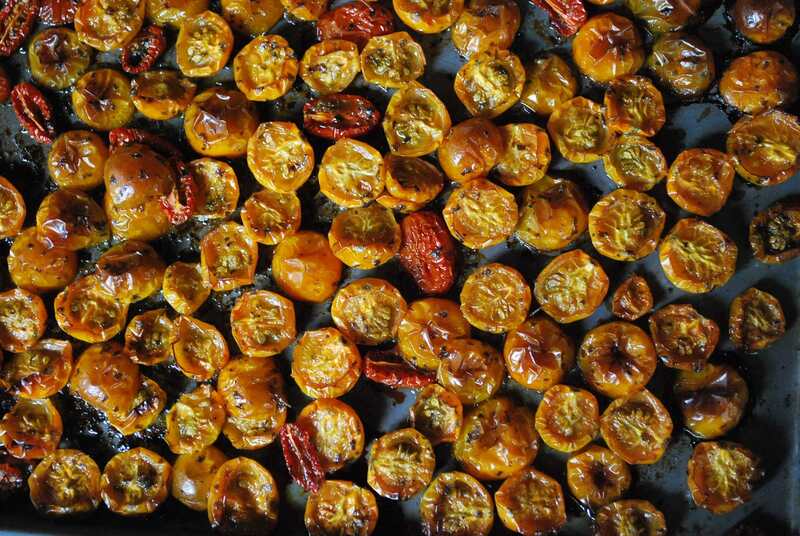 I was sick to death of slow-roasted tomatoes by the time I was done. Not sick of the taste. Sick of the process. But I used them through-out the year in pasta sauces, as a dip, on sandwiches, in salads. There is nothing quite like them for their taste and versatility. Of course by March I mourned their absence when I went to the freezer and found it empty. So this year I’m roasting more. Truckloads. I’ve started early, now that they are out, and will continue on until there are no more to buy. My freezer will be full and hopefully I’ll make it to Summer 2011 with some still staring up at me conjuring up memories of sun, heat, and long evenings drinking rose on the back terrace at the farm. Clean and halve cherry tomatoes. Put in a large mixing bowl. Make basil olive oil by mixing basil (any amount but I use lots) with olive oil in a food processor. Pour over tomatoes. Add salt and pepper to taste. Spread on baking sheets and slow-roast in an oven heated to 250 degrees for about 4 hours until done to your liking. Let cool and start using them for everything. I store them in small ziplock bags and thaw as needed. Ruth – I whipped up a batch of these tonight and they were amazing. Tossed in a bunch of garlic as well for added pizazz! They were the base for a delish tapenade. Thanks for the recipe! Awesome!Turning them into a tapenade sounds logical and tasty. And I’m always into tossing in a bunch of garlic. Thanks for trying it out and providing additional inspiration! I’m making these this afternoon – thanks to food love from Back 40 Veg and this recipe. Nice tip Dani, I may try that! I made these last night and forgot to take them out of the oven so they cooked for 8 hours instead of 4, with no apparent ill effect. I was surprised that while reduced, they were not dried whatsoever. Should they have been more dry when they were finished? Was 170 F too low to roast them? In any event, they sure taste good!